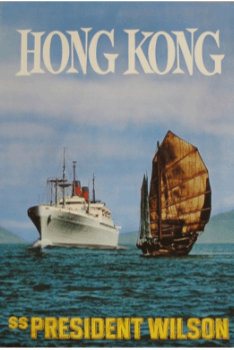 In the 1950s and 1960s, many American entrepreneurs played critical roles in the industrial development of Hong Kong as the US emerged as the number one export market for “Made in HK” products. Several of whom such as Linden Johnson of Mandarin Textiles, the Rothstein brothers of Zunino Altman (plastic flowers), the Newton family of American Marine (sailboats), Rosalind Henwood of Flying Cargo (airfreight) and George Baker of International Service Corp (radios) have been profiled earlier. There are many others which I will profile here later in other articles but recently I came across the remarkable story of Mrs. June Carroll, who first visited Hong Kong as a tourist in 1955 and ended up building Carroll Manufacturing, a decent size garment manufacturer in Hong Kong by the early-mid 1960s. Described by Saturday Evening Post as a “pleasant, schoolmarmish divorcee from Indiana”, Carroll was very impressed by HK from her first visit and afterwards worked for the American President Lines transpacific liner “S.S. President Wilson” for three years managing its gift shop and also procuring products from HK for sale in the US on the side which was common amongst personnel working for US airlines and shipping companies at the time. In 1961, she finally decided to settle in Hong Kong on her 20th visit and started a small-scale garment manufacturing operation with 7 sewing machines and the first year of operations was difficult as there were increasing pressure in the US to restrict imports of garments from the Far East. Fortunately, the client base in the US and Europe she built over the years began to pay off and, in the spring of 1962, she received a large order of sports clothing. To differentiate from her competition, Carroll focused on products rather than low cost, designing and making medium priced beaded knit dresses and jackets and in addition wool and cotton, also used new polyester fiber developed by Du Pont. In July of the same year, Carroll Manufacturing moved into a 5000 sq ft of space on Canton Road in Tsim Sha Tsui and was incorporated in August. By 1963, the factory employed over 80 Chinese workers (mostly female) who were paid daily wages of HK$8 and its hand-knitted products were exported to the US, Europe and the Middle East with Lebanon being a big market. In 1964, the firm’s address was listed as 906 Sincere House at 83 Argyle Street in Mongkok. 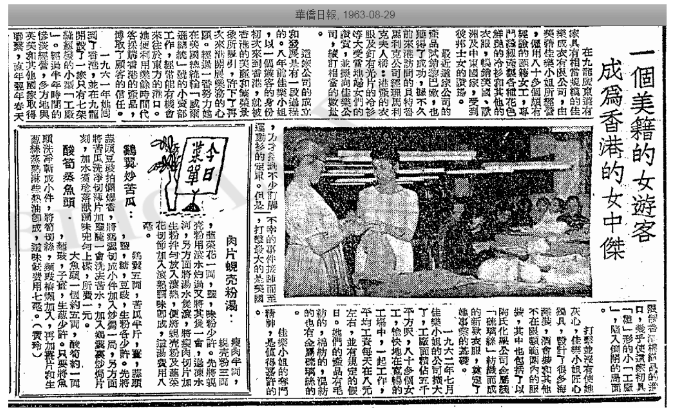 In a letter to leading trade publication in the US – Women’s Wear Daily the same year, Carroll predicted “with the ever-increasing traffic of large department store buyers to the Orient, it is my opinion that the next move will be for each chain to set up its own design center in Hong Kong under the direction of a local resident to create as well as develop the various ideas of its buyers.” By 1965 and 1966, some of her products appeared in the US under the “June Carroll Originals” label. In 1967, the Far Eastern Economic Review compiled a list of American firms operating in Hong Kong and Carroll Manufacturing was listed in the clothing section next to Cluett Peabody, the famous maker of Arrow shirts. As a firm, Carroll Manufacturing was dissolved in 1976. This article was first posted on 29th March 2019.